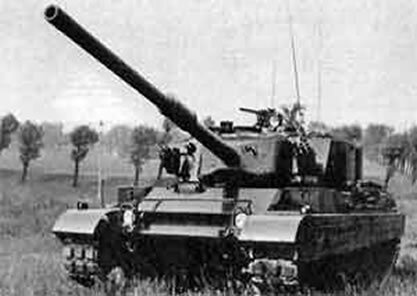 The L7 105mm main gun was a great success for the British Centurion tank. 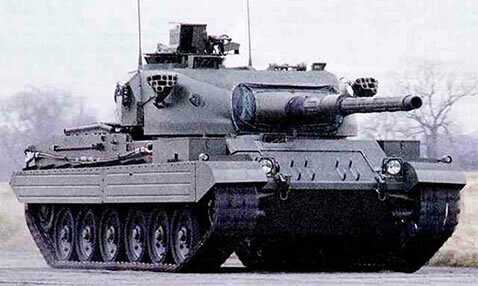 The Centurion was superseded in production by the mighty Chieftain Main Battle Tank with a 120mm main gun. However it was an expensive vehicle to purchase, so Vickers (not Alvis Vickers or VDS) decided to build a reduced cost export vehicle for non NATO nations, which used some parts of the Chieftain but retained the L7 105mm. This offered future operators a reduced operational cost, as so many countries were still using the L7, which generated a greater demand for the ammo, which in turn drove down the production and purchase costs. The Chieftain parts used were the Leyland L60 engine, semi-automatic transmission and steering. This of course meant that the production cost of the vehicle was cheaper, rather than sourcing and manufacturing new alternative parts. The vehicle was amphibious with an erected screen, using tracks for propulsion. The Mk1 could be equipped with many optional extra’s, such as Machine Guns, FCS’s, NBC systems etc. It was purchased by two nation’s, India and Kuwait. Kuwait’s were manufactured by Vickers and delivered between 1970 to 1972, totalling 70. India licence built the Mk1 under the local designation “Vijayanta” from 1965, totalling 2000 vehicles (first 70 were manufactured in the UK). The vehicle was equipped with a coaxial 12.7mm for ranging targets, but later vehicles were equipped with the Marconi Radar Fire Control System. The Mk3 was an improved Mk1. It had a new turret with a cast steel front that retained the L7 105mm (A1) main gun. The engine was also new, a Detroit 12V-71T diesel generating 720bhp. Commander had (non-hunter killer) day and night sight, gunner had a x1 x10 magnification sight with a laser range finder and ballistic computer. It used a coaxial 12.7mm MG and two other 7.62mm MG’s. It offered the ability to install many optional extra’s. Kenya purchased 38 tanks and 4 ARV’s in 1978. 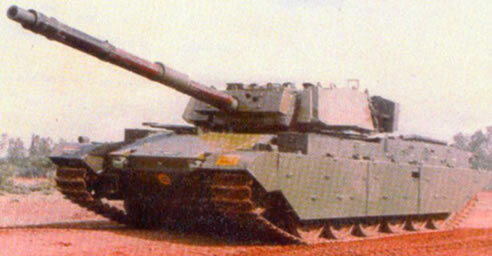 Nigeria purchased 36 tanks, 5 ARV’s and 6 AVLB’s in 1981, with a repeat order in 1985 and an unspecified order in 1991. The Mk3M was for the Malaysian market and equipped with ERA over the front of the vehicle. The Mk3i was the most recent model. Neither the I or M were purchased.